A series of support groups is being launched in Dubai to offer advice and psychological support to patients suffering from chronic illness. 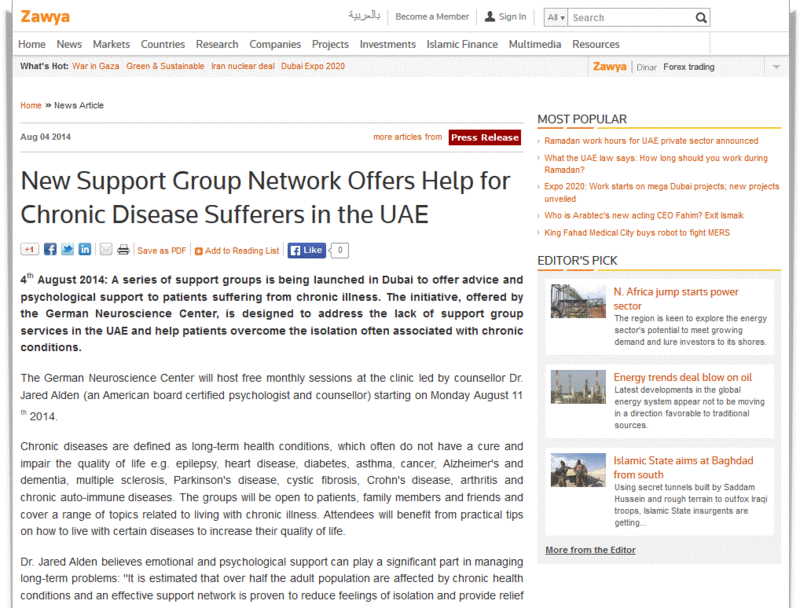 The initiative, offered by the German Neuroscience Center, is designed to address the lack of support group services in the UAE and help patients overcome the isolation often associated with chronic conditions. The German Neuroscience Center will host free monthly sessions at the clinic led by counsellor Dr. Jared Alden (an American board certified psychologist and counsellor) starting on Monday August 11th 2014. Chronic diseases are defined as long-term health conditions, which often do not have a cure and impair the quality of life e.g. epilepsy, heart disease, diabetes, asthma, cancer, Alzheimer’s and dementia, multiple sclerosis, Parkinson’s disease, cystic fibrosis, Crohn’s disease, arthritis and chronic auto-immune diseases. The groups will be open to patients, family members and friends and cover a range of topics related to living with chronic illness. Attendees will benefit from practical tips on how to live with certain diseases to increase their quality of life. Dr. Jared Alden believes emotional and psychological support can play a significant part in managing long-term problems: ”It is estimated that over half the adult population are affected by chronic health conditions and an effective support network is proven to reduce feelings of isolation and provide relief for sufferers and their loved ones. Unfortunately group initiatives such as this are still underdeveloped in the UAE and we want to provide a safe, relaxed environment for people to share their experiences and ask questions. ”Negative thoughts and feelings of depression can exacerbate physical symptoms whereas, by maintaining a positive mindset patients are better able to deal with their condition and improve their overall well-being,” added Dr. Alden. The free support groups will be held on a monthly basis starting on Monday August 11th at 7.30pm at the German Neuroscience Center in Dubai Healthcare City, Building 64, Al Razi, Block A, 2nd floor, Clinic 2006. To book your place contact 04 4298 578; www.gncdubai.com.